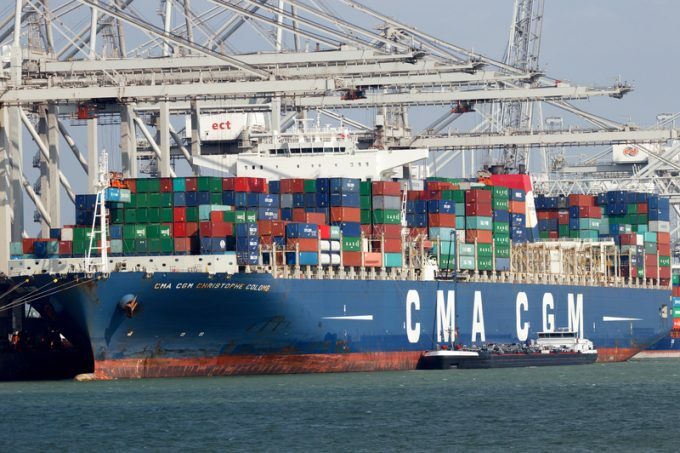 The European Commission’s competition directorate has cleared CMA CGM’s acquisition of Singapore line APL and its parent company, NOL – with the proviso that it withdraws APL from the G6 alliance. Competition commissioner Margrethe Vestager said: “Container liner shipping plays a central role in global trade, so competition in this sector is essential for businesses and consumers in the EU. The commission said it had studied the effects of the merger on the competitive landscape of some 17 shipping trades connecting Europe with the rest of the world – examining both the enlarged CMA CGM, as well as the market position of the new company, if APL had retained its membership of the G6 Alliance and CMA CGM remained part of the O3 Alliance. It concluded that the transatlantic and Europe-Middle East trades could have been subject to a distortion of competition. “The commission found that the merger, as initially notified, would have created new links between previously unconnected consortia in the O3 and G6 alliances. The commission had concerns that these potential new links would have resulted in anti-competitive effects on two trade routes: between Northern Europe and North America, and between Northern Europe and the Middle East. “On these routes, competition from liner shippers [carriers] who have no connection with the merged entity or its alliance partners would have been insufficient. As a result, the transaction could have enabled the merged entity, through the consortia that the two companies belong to, to influence capacity and therefore prices to the detriment of shippers and consumers for a very large part of those markets,” the commission said in a statement today. It further revealed that CMA CGM had offered to pull APL out of the G6 to see the deal through. “Although NOL will continue to operate for G6 until 31 March 2017, to guarantee an orderly exit, the commitments foresee that a trustee will ensure that no anti-competitive information is shared between the alliance and the merged entity during that remaining period. This will eliminate the potential additional links between previously unrelated consortia that the merger would have created on the two routes,” the EC said. The point has been made rather moot by the recent announcement that CMA CGM is to create a new alliance with Evergreen, COSCO-China Shipping and OOCL when the current alliance structure breaks up at the end of the first quarter next year – an arrangement APL will be part of if CMA CGM’s acquisition completes. The EC added that the merger would also see some consolidation in the respective lines’ terminal operating divisions, although the combined market share of their terminals would have little effect on the market.